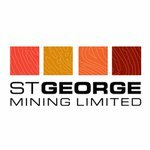 St George Mining Ltd (ASX:SGQ) are gearing up for another major nickel drilling push at East Laverton in Western Australia – an area that could potentially become another Fraser Range. At East Laverton, SGQ’s ground is under explored, it’s the right geological setting for nickel deposits, it’s got a strike length over 130km within 3 extensive ultramafic belts – and it’s all SGQ’s. 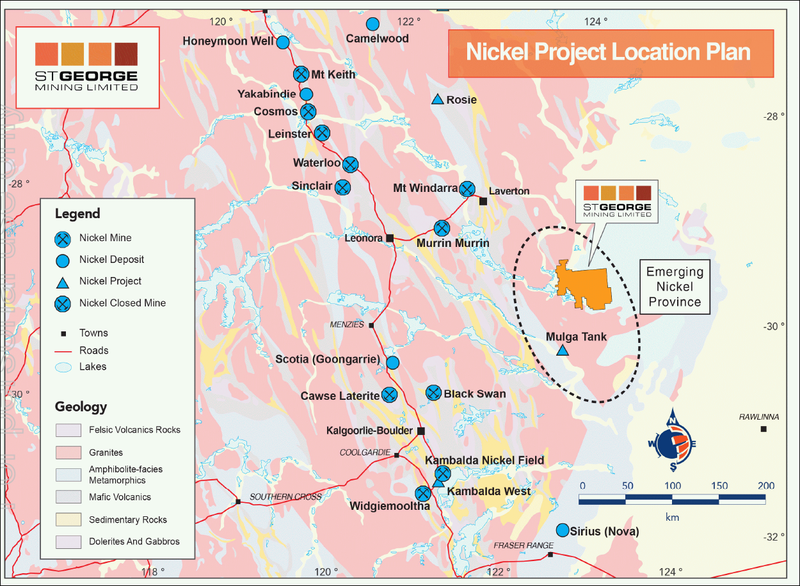 Over 4,000 metres of pinpointed nickel drilling is set to begin any day now. Drilling will test multiple nickel sulphide targets, defined by both electromagnetics and geological indicators. As with all mineral explorers, SGQ may not find anything... But with multiple targets across their ground, discovery potential is multiplied. 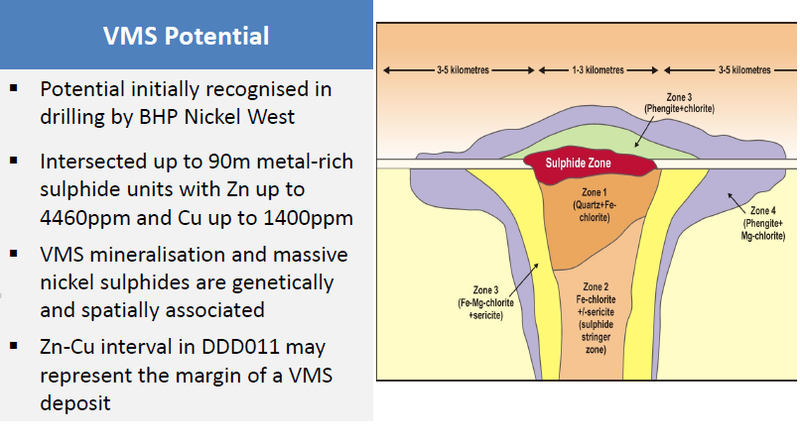 And it’s not just nickel, SGQ have identified new Volcanic Massive Sulphide targets that could host substantial deposits of the new “It” metal, zinc. SGQ aren’t looking for a new Nova or Bollinger – they are looking for a new Fraser Range. And if they find it, they will have pole position with a large, dominant land position. 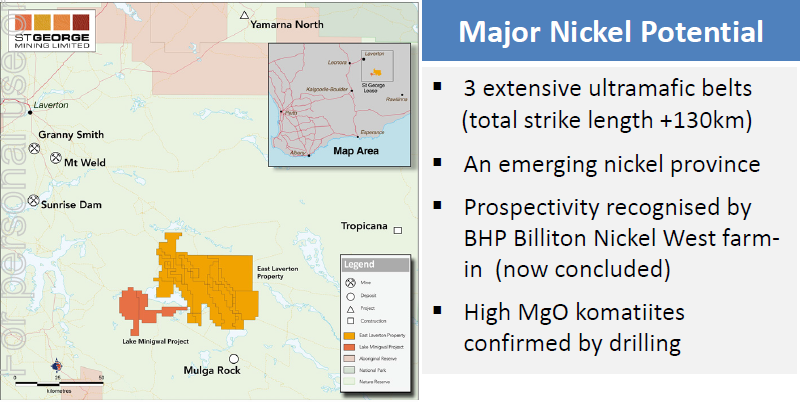 Consultant geologist Matthew McCarthy was part of the team that made the recent discovery of the Venus nickel sulphide deposit at Leinster, and also managed the BHP Billiton Nickel West exploration efforts on this ground, now 100% SGQ’s. Since the Next Small Cap article on Segue Resources (ASX:SEG), Sirius went from 5c to $5... New Upstart Explorer Has More Land, More Drilling Targets , SEG has been up as high as 200%. After we released the Next Mining Boom article on NSL Consolidated (ASX:NSL), Tiny Miner’s First Sales Days Away: Stockpiles Waiting to Be Processed, Delivering Instant Cash Flow , NSL has risen as high as 80%. Following the Next Mining Boom article on Apollo Minerals (ASX:AON), Drilling Results in Days: Billionaire Backer Hunting Mammoth IOCG Deposits with Tiny Explorer , AON has risen as high as 90% since. Following the Next Oil Rush article on Austin Exploration (ASX:AKK), $20M to $5.6BN: Can He Do It Again? Multiple Catalysts In Weeks , AKK has risen as high as 130% since. This hole was drilled to test an electromagnetic off-belt conductor... A separate conductor next door, Dragon 3, has not been drilled at all, and could represent the VMS system epicentre, with higher grades of zinc and copper. Newexco are also guiding SGQ’s base metal hunt – most would know of Newexco’s success with nickel, but they were also involved with exploration at Sandfire Resources’ monster DeGrussa deposit. SGQ could be onto something big, because VMS base metal deposits usually form in clusters, with several deposits a few dozen square kilometres. SGQ holds 2,000 km 2 in the region – so if they are lucky and can find one zinc-copper system, chances are there might be more, and SGQ would own the lot of them. We should learn a whole lot more about this potential once the drilling campaign kicks off in the next couple of days. In late September, SGQ added over $2.5 million to its exploration war chest. First, investors chimed in $1.75 million at $0.09... and these investors included SGQ’s key service providers for the next drilling campaign in Newexco and VM Drilling. It’s a glowing endorsement of an explorer’s prospects when both the drilling company AND the geotechnical services company both come to the table during a funds raising. In a market where other junior explorers are being starved of cash, SGQ’s bank balance appears to be bulging. SGQ will be able to fund its ongoing, high impact exploration of advanced nickel sulphide and zinc-copper targets for some time yet. Right Place at the Right Time? 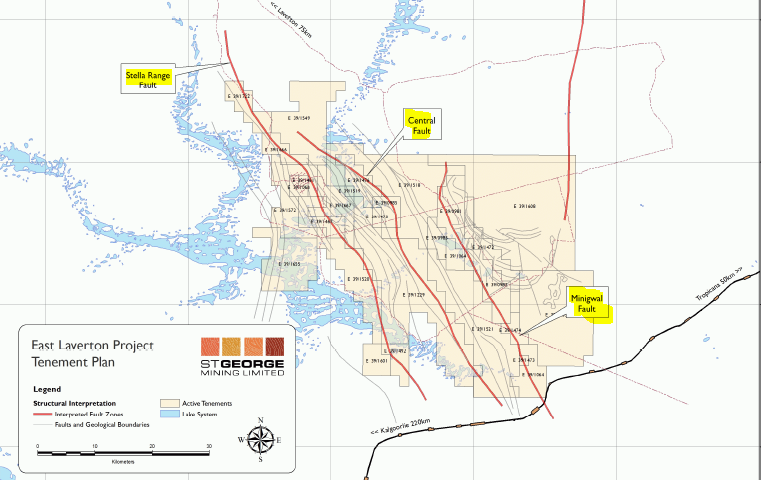 So SGQ is about to get drilling for large nickel and zinc-copper deposits. 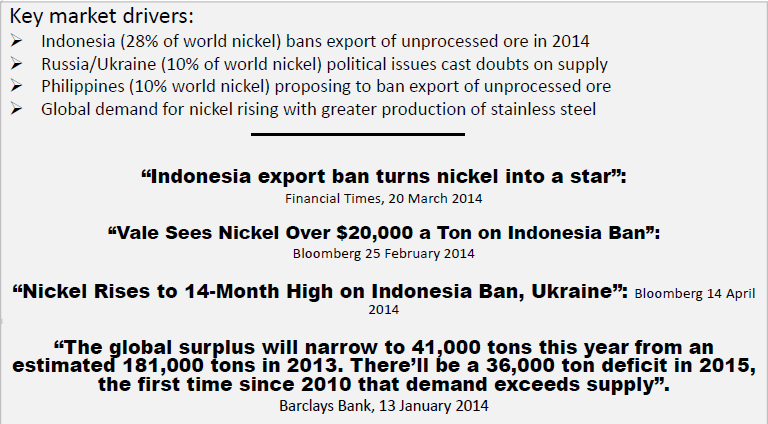 The geology has been proven fertile, and nickel and zinc prices are stronger than they have been in years. It looks like a perfect collision... if they hit something high grade, it might be game on... Particularly so because of SGQ’s miniscule free float. SGQ management hold 1/5th of SGQ’s 92 million shares, the top 3 holders control 36%, and the top 20 control 55%. SGQ’s free float is really only about 40 million shares... in the event of discovery, traders and investors may be scrambling to get in. We would rather not be one of the scramblers chasing higher and higher prices – we have avoided this by taking a position early, while the price is cheap and some uncertainty remains. As if SGQ didn’t have enough nickel targets to poke their drill bit at, Phase 1 drilling also unveiled a big bonus – zinc and copper mineralisation. As you may know, now is certainly the right time to be discovering zinc too. Assays at conductor Dragon 2 delivered an interval of zinc and copper sulphides which hints that a base metal deposit lies in the vicinity. 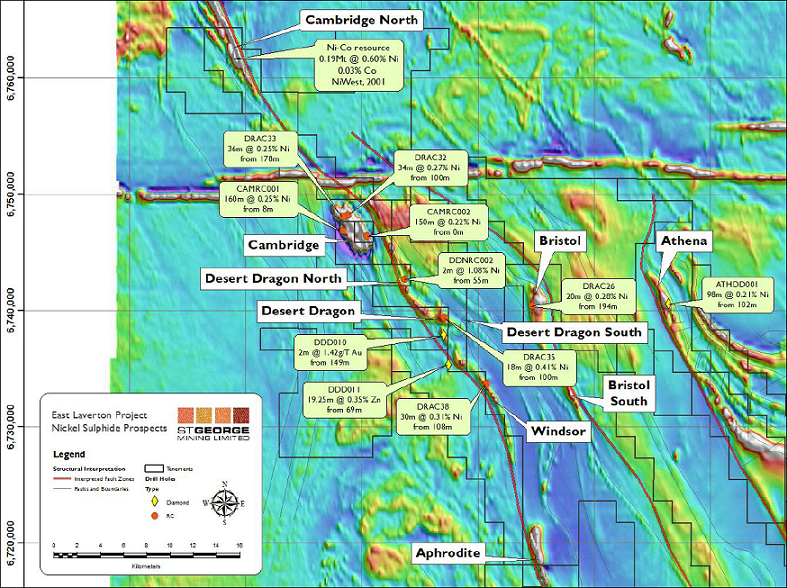 In fact the zinc-copper geology intersected is typical of the outer margin of a VMS base metal system... A system that extends into the adjoining Dragon 3 conductor and is yet to be drilled. 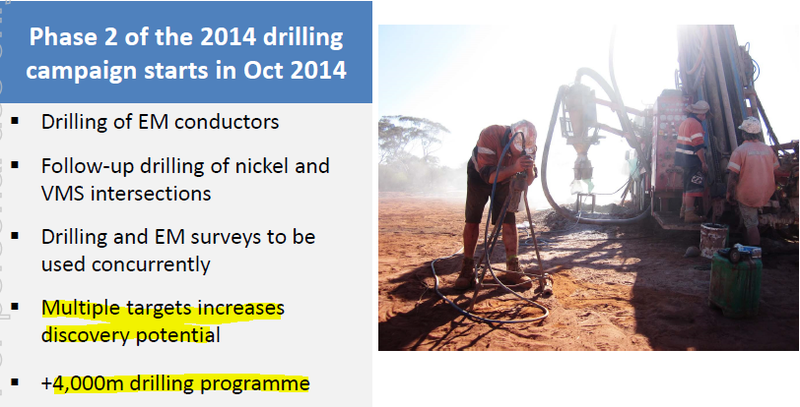 Drilling of Dragon 3 in just a few days is the big one for SGQ investors hoping for significant zinc intercepts. There are more conductors prospective for zinc and nickel being identified via electromagnetics as we write...these will also be incorporated into the campaign. The best way to find a big metal deposit is to establish ideal regional geology, define multiple targets, and drill lots and lots of holes. This is exactly what SGQ are doing and they are getting closer and closer to cracking the code.